I had Ubuntu's Karmic Koala installed as a triple boot option on my MacBook. 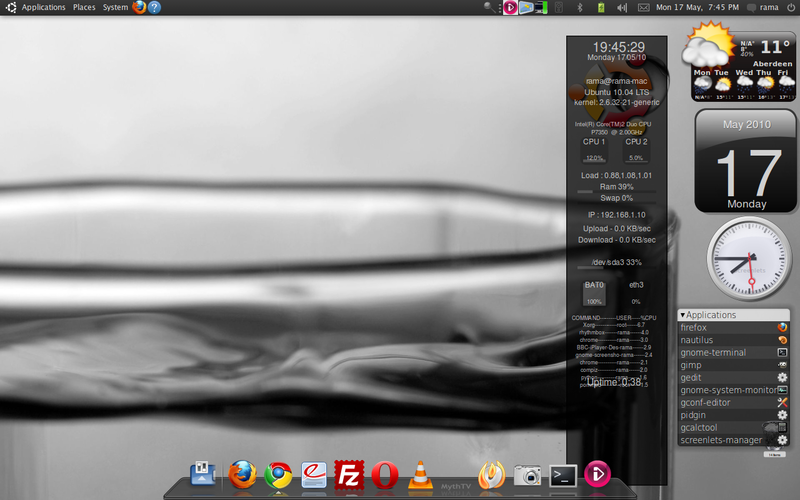 Following the release of Lucid Lynx (Ubuntu 10.04 LTS), I promptly upgraded using the Alternate Install CD. Though the upgrade was fairly smooth there were a few glitches. The things that didn't work out of the box were Awn (Avant Window Navigator), Screenlets and wicd. To make Awn work, I had to enable the Compiz Visual Effects, which was set to None by default. For this you have to go to System>Preferences>Appearance and then to go to Visual Effects and switch to Normal or Extra. For Screenlets to work I had to reinstall them. In case of wicd, it was a simple case of uninstalling the default Gnome Network Manager and installing wicd.